Wouldn't it be terrific if we all had a sign that said " I support the Vermont National Guard" to welcome our friends and neighbors who are returning home this holiday season? I am working with Rep. George Till from Jericho selling baseball style hats to support the Vermont National Guard Charitable Foundation. 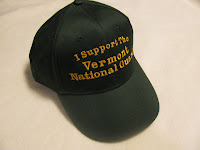 The hats are green with gold lettering that says - "I Support the Vermont National Guard". The donation for one hat is $10, with $5 covering the cost and $5 donated to the VTNG Foundation. The foundation provides emergency financial support to members of the guard without the obligation of repayment. Please call or email me with your order: 425-3960 or myantachka.dfa@gmail.com. I will bring some to the Rep Meetup at the Town Office on Monday, Dec 13th, at 8:00 AM.